1. Mix together the gin and tonic in a large jug. 2. 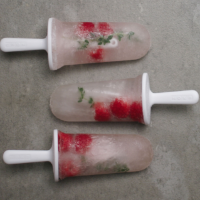 Divide the thyme sprigs and raspberries between 6 x 100ml lolly moulds. 3. Pour in the gin and tonic and freeze overnight until solid. Briefly dip in a jug of hot water to release the lollies from their moulds. If you don’t have any lolly moulds, freeze the G&T mix in a suitable container overnight. Break up the crystals with a fork (or in a blender) and spoon into small glasses, top with raspberries and thyme.